Progress on Kate’s “big girl” room has been slow since we were in a rush to get her moved into it, and I had only accomplished the bare minimum prior to her move-in date. Luckily I’ve gotten a few more things accomplished since your first look at Kate’s new space. Kate’s Room, version 2.1 – with many more versions to come! Window treatments were my first order of business. I was looking for black and white striped drapes and as luck would have it, I found exactly what I wanted on the cheap at IKEA. I wanted to continue with the option to black out Kate’s room at naptime and bedtime, but black out shades for a window this size would’ve cost us all our crack money were way too expensive. Even trying to find a plain white roman shade this width that I could add my own blackout liner to was ridiculously out of my price range. 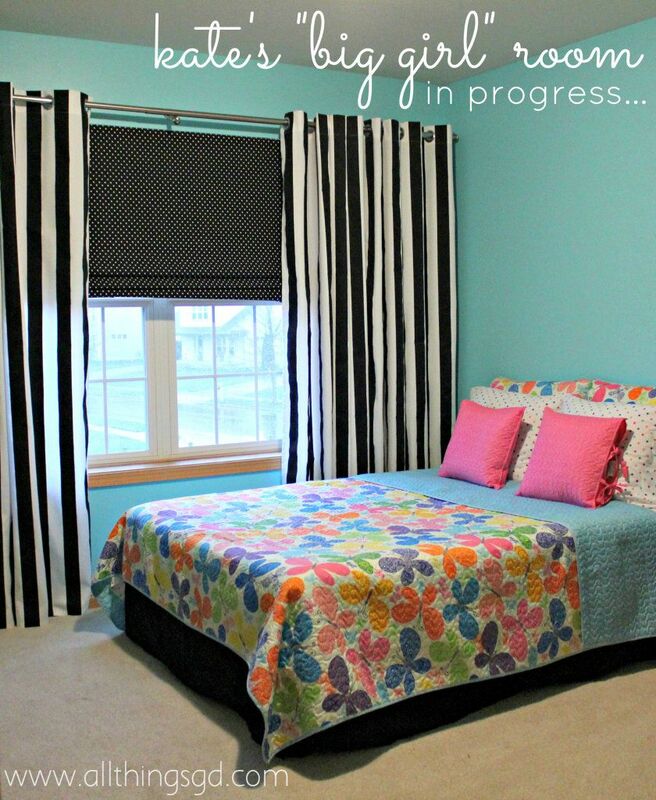 I remembered years ago seeing a tutorial on how to turn vinyl blinds (like the one already in her room) into DIY roman shades, so I searched out tutorials, pieced a few together along with some trial and error (and black and white polka dot fabric), and made my own DIY blackout roman shade for just the price of fabric! 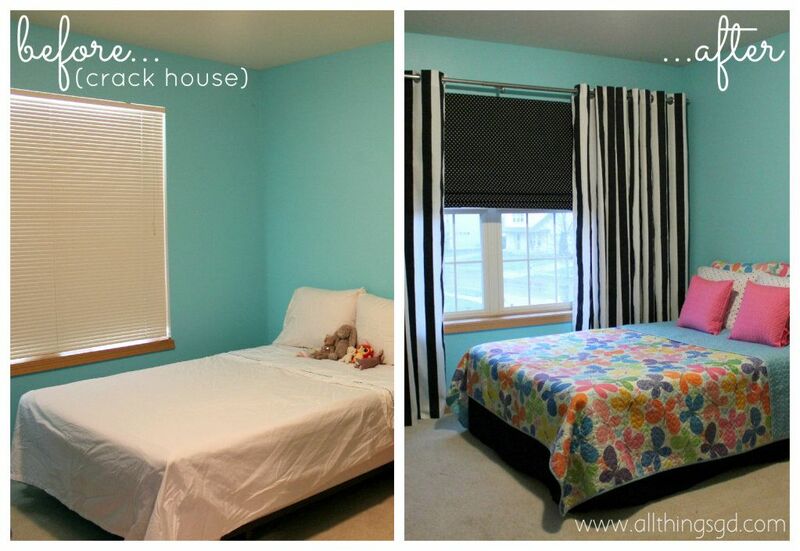 Vinyl blinds turned into a DIY blackout (polka dot!) roman shade. She had a similar reaction when I finally got around to buying her bedding. Kate was the one who actually spotted the butterfly quilt that’s now on her bed while we were “exploring” at the mall one day. We wandered up to the second floor of Boston Store (something we never do) and Kate spotted this butterfly set in the bedding section. 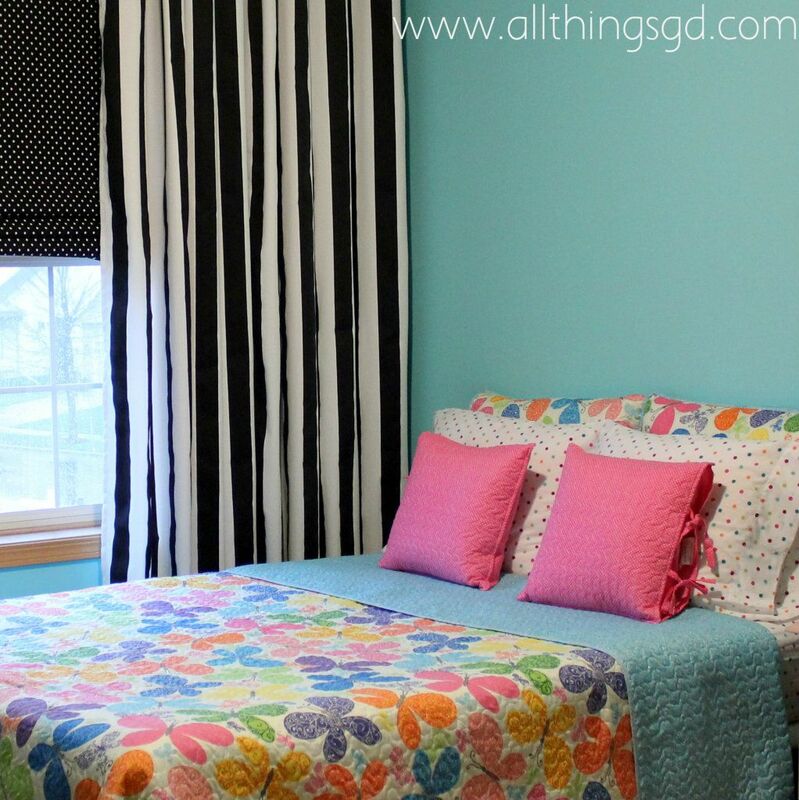 It wasn’t exactly the colors I originally had in mind for her room, but she loved it so much (and it was on sale!) so we bought it, along with two matching pink toss pillows and a fuzzy purple pillow (not pictured) that she adores – all for about $50! Close-up of Kate’s butterfly and “polka pot” bedding. The other side of Kate’s room (across from her bed) is slowly coming together. I’m reusing the purple dresser from Kate’s nursery, and now that Kate’s potty trained we no longer needed the changing pad that had been sitting on it. The two baskets on top of her dresser originally held diapers, wipes, sanitizer and lotion. I decided to keep the wipes/sanitizer/lotion basket the same (because you never know when you’re going to need it, am I right?) and used her diaper basket to corral some of her favorite bedtime books. The wall art is all from Hobby Lobby (clearance – woot!) and works great for now, especially since giraffes are one of Kate’s favorite animals! 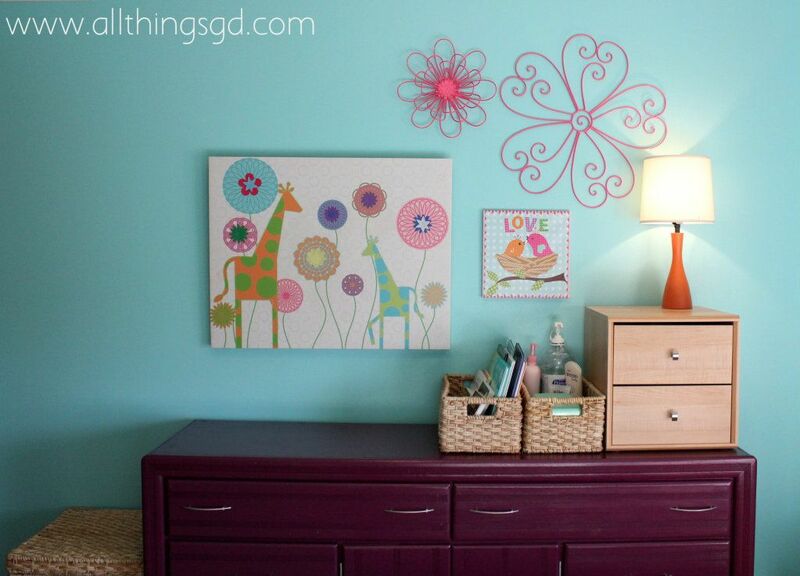 Kate’s dresser and wall art. And that’s my progress on Kate’s room so far! As you can see from my graphic below, there is still plenty to do, but at least we’ve got a little color and life in here for now – and I’m tickled to pieces that Kate loves it as much as she does! Aren’t kids rooms so much fun to design? I swear, I have been through 4 or 5 different ideas for the monster’s ‘big boy room’ already– and he’s not even 18 months old yet. LOOOOOVEEEEE the color combo. Love it all. I can’t wait to see what’s in this super secret corner. What an adorable room! I can’t wait to see the rest! p.s. – crack house, polka pot…what’s going on at the G&D household?? This is looking great! And you once again have me cracking up (no pun intended). 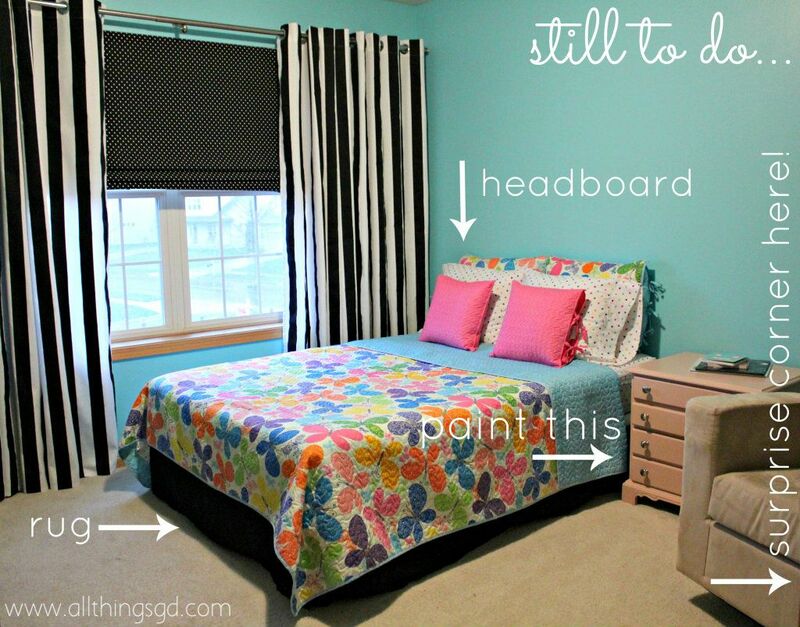 Love the wall color and the wall collage over her dresser! It’s looking great and can’t wait to see what’s in the surprise corner! Yah! SO cute! I love it. You’re inspiring me to get a move on the nursery (my first baby is due in June – a boy!). Also, I love the cursive font you used in your photos…what is it? LOVE LOVE LOVE the striped curtains and how you made it so the window looks so much bigger!! @Desiree: I’ll try to post a tutorial, but in the meantime if you google “DIY roman shades out of vinyl blinds” I’m sure you’ll find a lot of ideas. That’s how I got started with mine. And I didn’t even notice the play on “polka pot” until you point it out – too funny! Thanks for the laugh, girl! @Rachel: Have fun with your little guy’s nursery! I had so much fun doing Kate’s first room. The cursive font is “Sacramento.” Enjoy! Thank you Sally! I pretty much do that in every room in our house. It’s a great little trick! Love this! It is so happy and fun!! Love this! I haven’t been to hobby lobby in ages! I need to get in there. We are working on our first kiddo’s big boy room… Dinosaurs! Thanks Amber and Ashley! @Ashley – a dinosaur theme sounds like so much fun! I’m sure your son will love it!